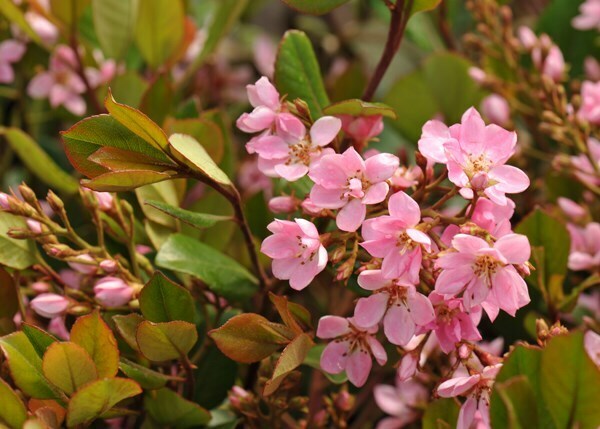 The soft pink, star-shaped flowers, which have a light scent, appear in soft clusters above the lustrous, evergreen foliage, creating a very pretty effect in late spring or early summer. Grow this sun-loving shrub at the base of a south-facing wall where it has protection from cold, drying winds for best effect. Garden care: Incorporate lots of well-rotted organic matter into the planting hole when planting. After flowering lightly prune any shoots that spoil the symmetry of the plant.